But I can assure you that rabbit meat is delicious… a bit like chicken (looks exactly like it…) but gamier. I recently spent a week at my parents’ house in Paris where rabbit meat is as common as chicken’s and was presented with two rabbits to cook for dinner. I had never cooked it and did not have many ingredients so decided to go for something I know how to do well: a wine stew. I mean you can never go wrong with wine and meat… add some butter and it’s heaven! 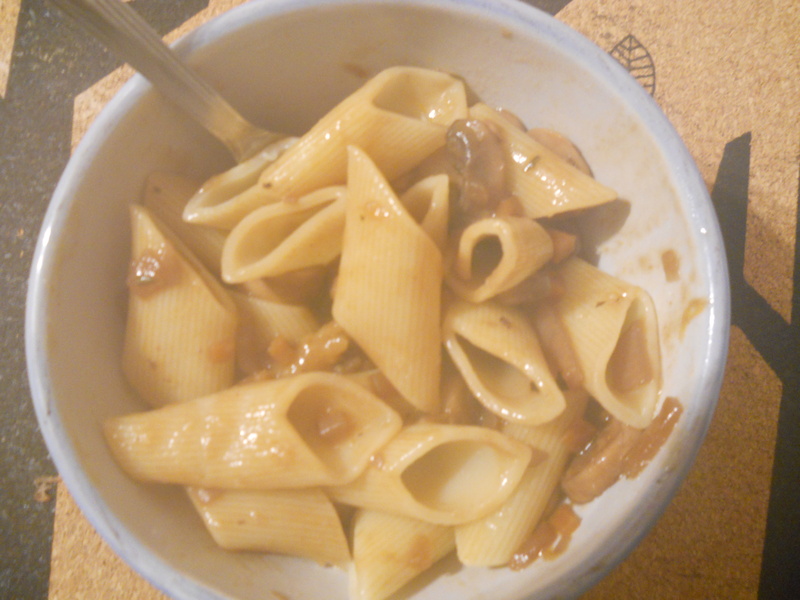 – 300 grams of mushrooms, roughly chopped (preferably a mix of nutty mushrooms). 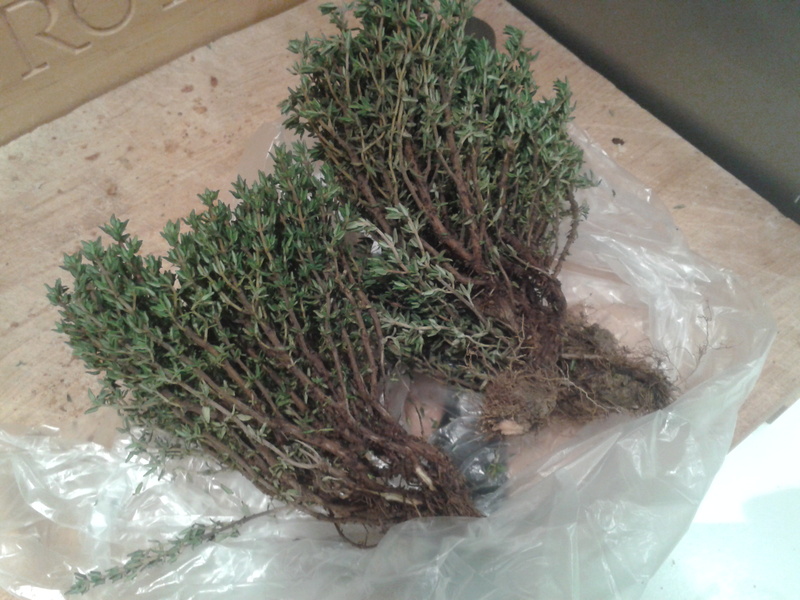 – Two bunches of thyme. 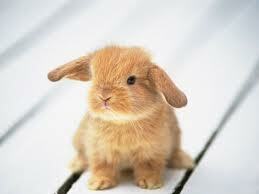 – Half a bottle of wine (pour the rest into a glass and drink it to get over the fact you’re eating a cute bunny). Start by adding a knob of butter to a pan and brown the rabbit pieces. Reserve and do the same with the mushrooms in batches so they brown but don’t become mushy. Put them aside with the rabbit and add more butter to the pan. Add the onion and carrots and sweat them for 5-10 minutes. When they become soft, turn up the heat and add the wine and the thyme. You can also add a bay leaf at this point. 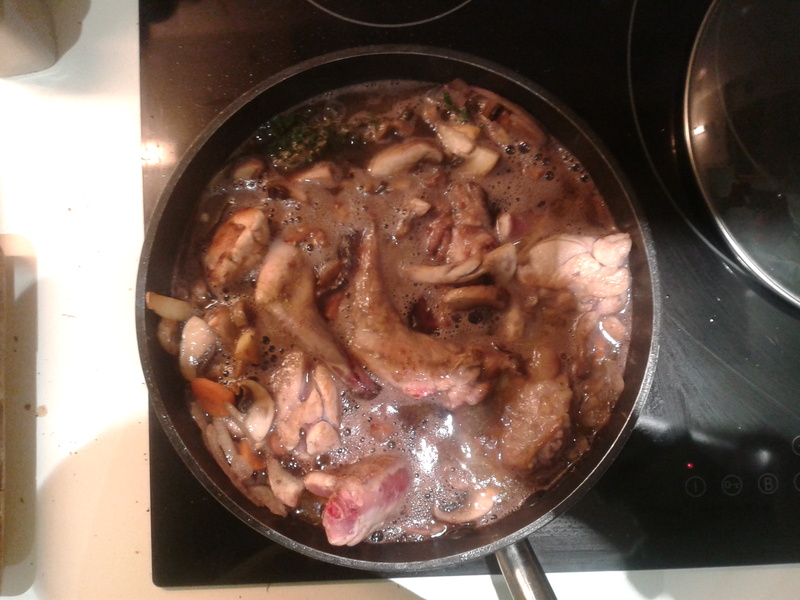 Let the wine reduce to half and then add the rabbit and the mushrooms. Make sure they are covered and add water if needed. Season with salt and pepper and let cook for at least 45 minutes on very low heat, with a lid on. When the meat looks like it’s cooked and almost falling off the bone take the lid off to let it reduce. Right now is the time to prepare the polenta. If you are experienced you can have a go at polenta flour which has too cook for 45 minutes with constant turning and gives you an arm ache and possibly some burns. If you are not an experienced Italian grandma, grab a good quality semi-ready polenta and follow the instructions. When the polenta is almost cooked add some cream or ricotta cheese and some parmesan. Season with salt and pepper and serve the stew over it. The next day, if you are lucky to have some stew and polenta left, serve them together. If like me all you had is polenta, fry it in a pan with some butter until it’s crispy. 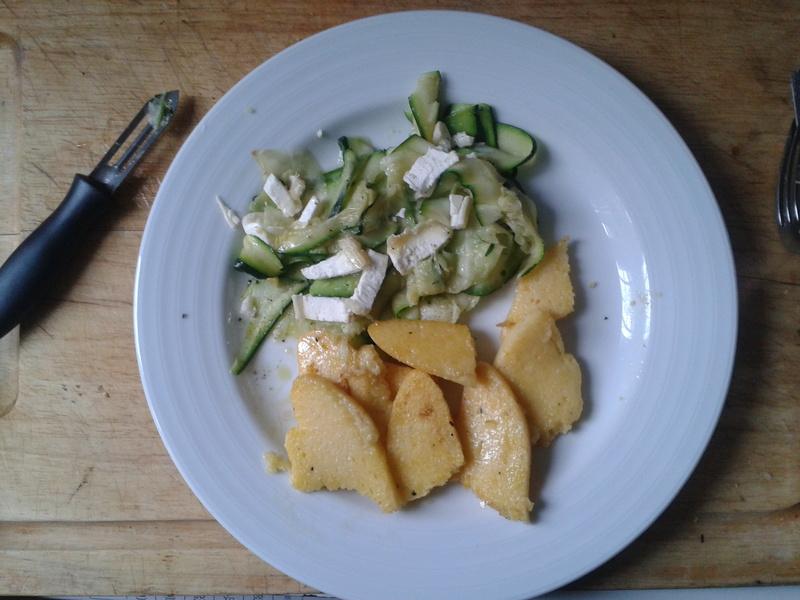 For the courgette, slice it really thinly (with a peeler or a mandolin) fry it for 2-3 minutes in some butter and sprinkle it with salt, pepper, good olive oil and goat’s cheese. And there you go: a really easy and healthy second meal after the indulgence of rabbit and wine. This is delicious, hearty and full of stuff that’s really good for you. I bet it has your 5 a day so I will call it 5 a day dhal. (For those of you not living in the UK, 5 a day is a government initiative trying to make Brits eat 5 pieces of fruit and vegetables every day). 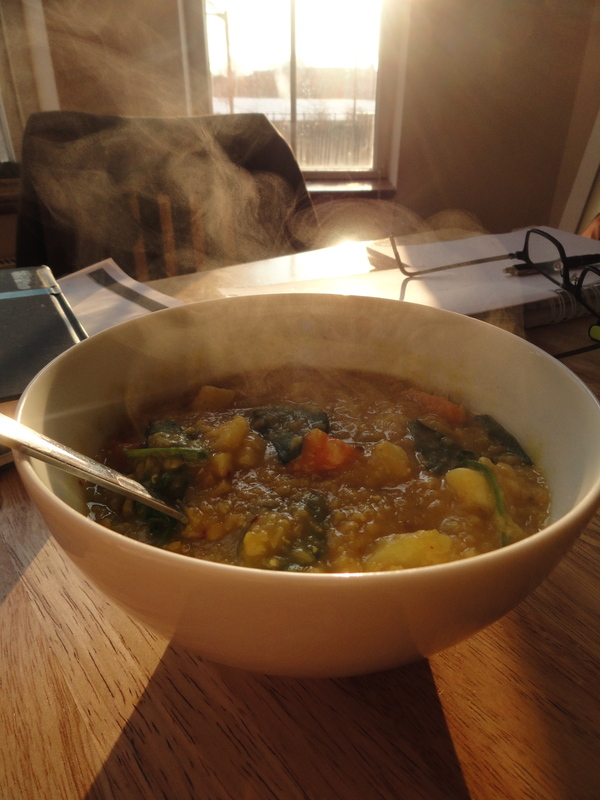 It is basically a lentil stew with carrots, potato and spinach (but I also count onion as a vegetable so together with the lentils it makes for 5 different vegetables), spiced with garam masala and cinnamon. It is very cheap. Probably £1 per serving, if even that. This is good to make in a large batch on sunday and keep eating for dinner throughout the week if you’re having a busy week ahead. Since it has lots of carrots (vitamin C), chili (anti-viral), garlic (just generally good) and ginger (anti-cold) it is a also a secret weapon during the cold season to keep the immune system boosted. Garam masala. I use a Swedish variety which until recently was the only thing named “curry” you could get in Sweden. (Saying you fancy a curry to a Swede might have the same effect as if you asked for some nutmeg to eat.) A good thing about Swedish curry, however, is that it is a sweet, mild and nutty variant of garam masala with plenty of turmeric, and it is delicious. Start by frying the onion in a bit of oil, then peel and chop the garlic and ginger and add into the oinons together with the garam masala to fry for a few minutes. 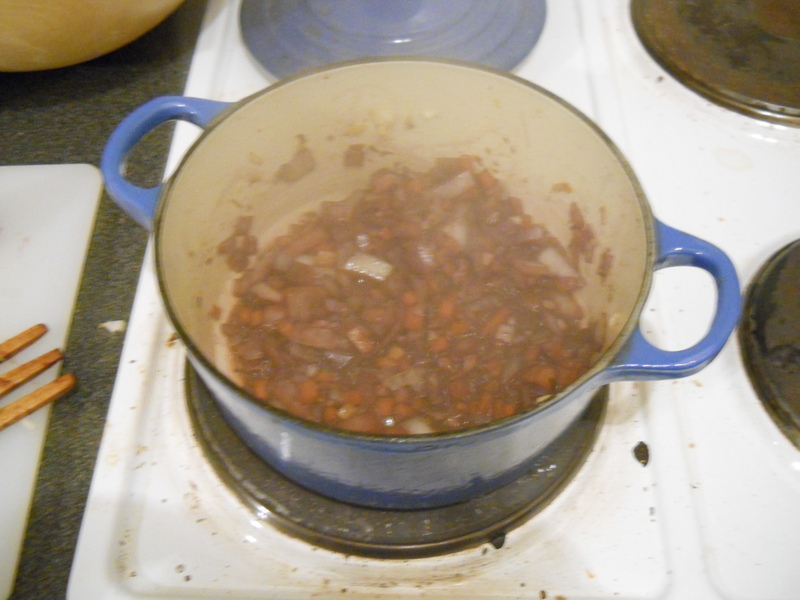 Rinse the lentils and add them to the pan together with the stock and chili. Peel the carrots and potato, and chop in rough bits. Add these to the boiling lentils in the pan, and bring the heat down for it to simmer for 20 minutes or until the lentils have softened and the potatoes and carrots gone the right consistency. Taste with salt and cinnamon, and stir in the fresh spinach so that it folds and softens. The result is a yellow mix between a soup and a stew, not too dissimilar to Innocent’s Indian daal pot (but at 15% of the price). Serve on its own, or together with some cheese grilled bread. When it’s freezing outside and you’re missing homely comfort food, there is nothing better than a stew. Although I would love to be able to cook and eat a boeuf bourguignon almost everyday, there just is no time for a five hour stew during the week. 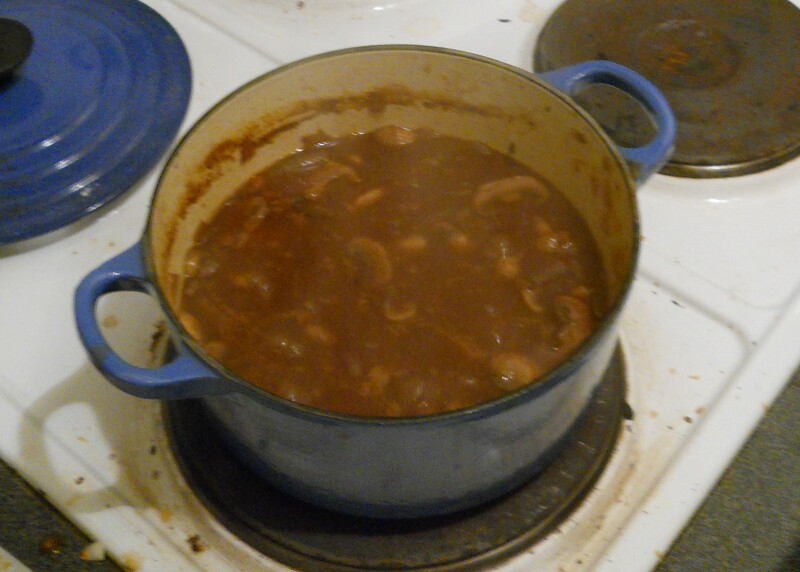 So I bring you an adaptation of the boeuf bourguignon, the equally decadent mushroom bourguignon. Altough the main ingredient (beef) changes, the other ingredients and method remain the same (bar the five hour cooking time!). This makes a very cheap and easy to make mid-week bourguignon. 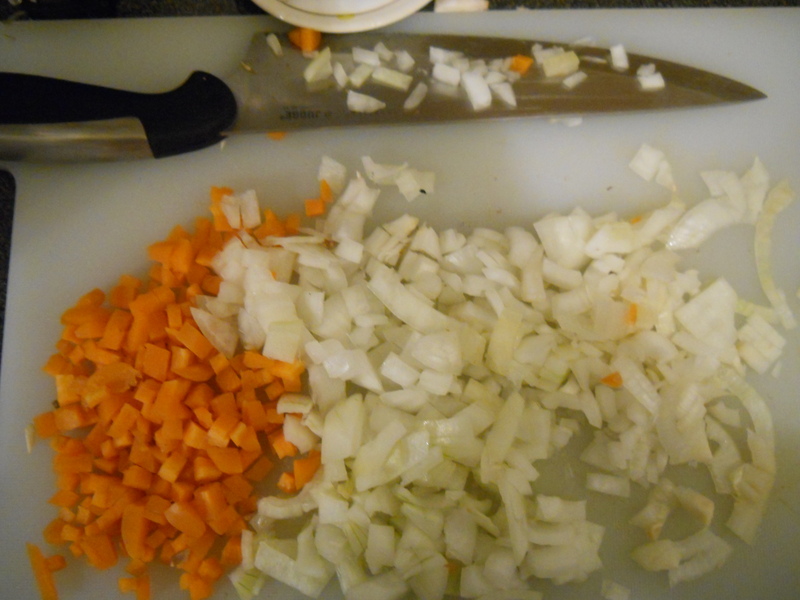 Onion, finely chopped (one per 2 person portion). Carrot, finely chopped (1/2 per 2 person portion). 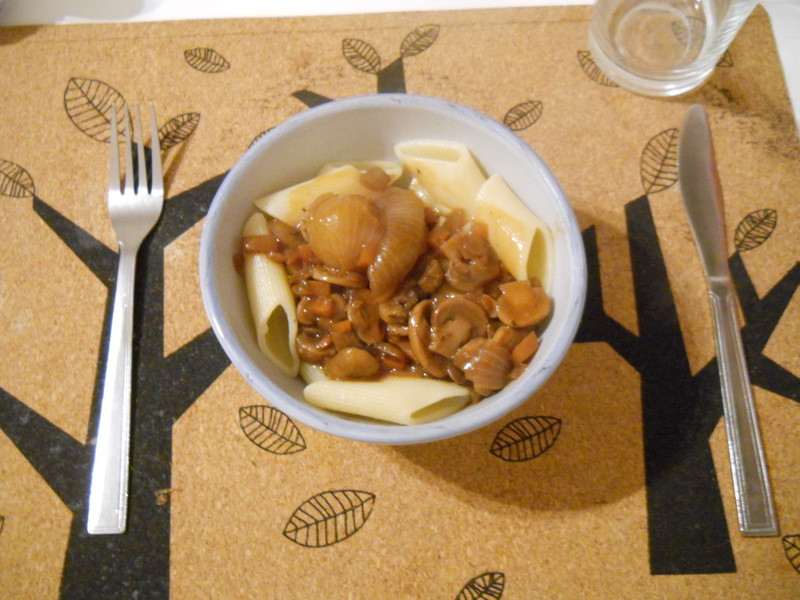 Mushroom, with no stems and chopped roughly (500 grams per 2 person portion). 1. Start by chopping the mushrooms and frying them in your pan in butter and olive oil on a high heat so that they brown. While they are cooking chop the carrot, onion and garlic. 2. 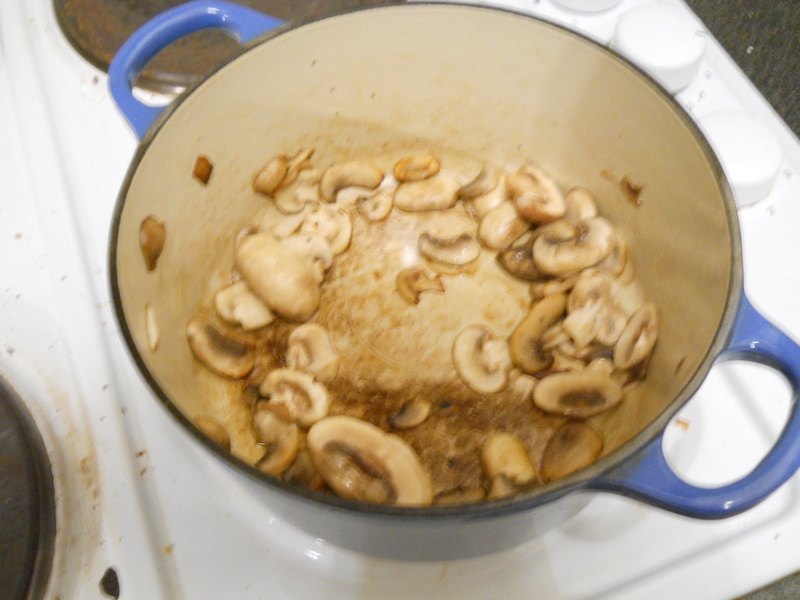 When the mushrooms are browned, take them from the pan and reserve. Turn the heat down to medium, add some olive oil to the pan and fry the onions, carrots and thyme, adding some salt and pepper to season. When the onion starts to brown add the garlic and fry for a further 2-3 minutes, stirring constantly so the garlic does not burn. 3. Turn the heat to high, add the wine and let it cook until it’s been reduced to half its original size. 4. Turn the heat down to a low setting, add the tomato paste, the stock and the mushrooms with the juice they have released from cooking (and the small onions, if using). Bring to the boil and then simmer until the mushrooms are tender. 5. While the stew is simmering start making a roux (it sounds harder than it is) and stir it in the stew when the mushrooms feel tender but the sauce is still a bit liquid. Simmer for a further 5 minutes to thicken the sauce and check the seasoning. Serve it over your favourite carbs. We had it over pasta, but it’s great over polenta or mash. Add a little bit of butter for extra amazingness.